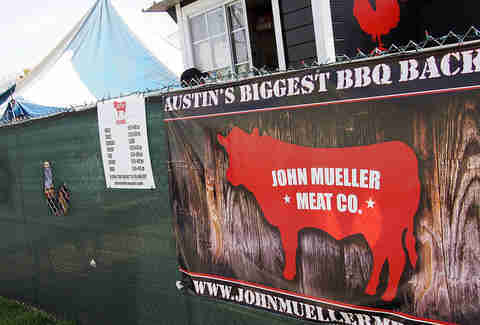 In the midst of Austin’s barbecue renaissance, most patrons spend their time in line thinking about the combination of meats in which they should partake. 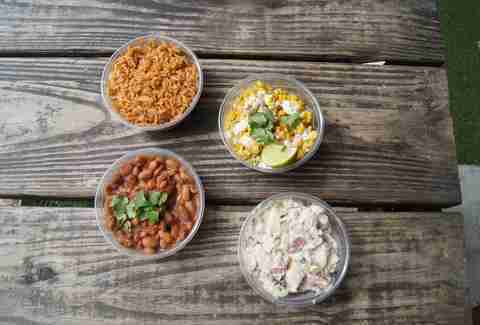 Sides, when discussed, are often thought of as a less essential component of the ‘cue experience. Though sides will never replace brisket, the pitmasters and cooks at these restaurants often take the same level of care with their accoutrements as they do with their prized brisket and ribs. 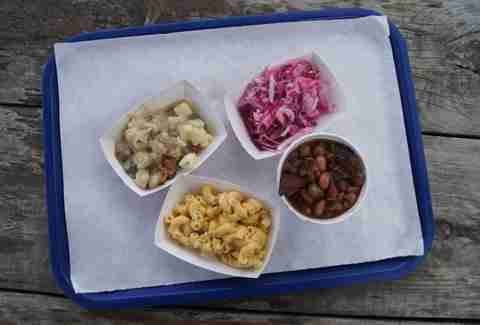 We sampled sides at a number of Austin’s best BBQ spots without any meat to accompany them. While this drew quizzical looks and smiles from the counter, it also emphasized that many BBQ establishments are serious about all of their food. To help you choose sides wisely, we offer a winner (or two) at most of Austin’s popular spots, along with recommendations from chefs, bartenders, and restaurant owners who love barbecue as much as you do. Perhaps the single least likely BBQ side on the list, Freedmen’s owner Jim Stockbauer declares the dish a personal favorite. "The smoke changes the composition of the vegetable," says Stockbauer, "and the cheese (herbed chèvre) really balances it." For those more inclined to go traditional, top sommelier Paula Rester (Congress, Maialino) recommends the coleslaw: "I don't believe in sauce. Good barbecue doesn't need it. But I do care deeply about coleslaw, and Freedman's has it right! 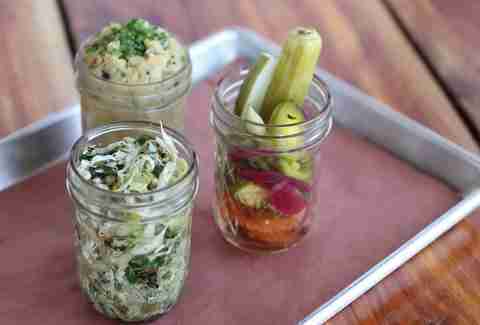 It’s served in a mini Mason jar to boot." When Larry McGuire and Lou Lambert have had a hand in the kitchen, it’s a safe bet that side items won’t be overlooked. 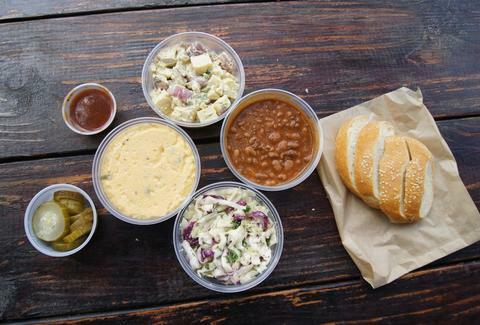 At Lamberts, you'll also find Austin’s longest BBQ sides selection -- a dozen choices are listed. Of them, our favorite is the bacon-braised collards, a comforting Southern classic that is salty, bitter, smoky, and warming in equal measure. While that may be our favorite, Lambert's partner Larry McGuire lobbies for a dark horse candidate: broccoli. "My favorite side is the spicy garlicky broccoli!" says McGuire. "The flowerets are blanched until crunchy and bright green, then sautéed with sliced garlic & jalapeño, butter, and lemon." We liked the fact that Blue Ox wasn’t mayo-heavy on their sides. While the beans were solid due to good black pepper spicing and a generous supply of trimmings, the warm potato salad handily won the day. Serving it warm might not be ideal for summer temps, but the mix of potato, bacon, vinegar, dill, mustard, and egg would be a satisfying accent to your fall visit. We’re gaming the system here, but the beans win mostly because you can sometimes find trimmings in them. They’re prepared in a spicy style, which we also admire. But mainly, they’re a spot to dig for additional brisket. Mueller’s beef ribs are perhaps the most decadent thing on the menu, but the cheesy squash may come in a close second. A gluttonous mix of squash, butter, and cheese, the dish survived from the old JMueller menu, and is every bit as good here. You can simultaneously eat a vegetable and clog your arteries, which counts as a win for many 'cue hounds. Micklethwait wins the prize of "most thoughtful sides" in Austin, with points scored for creativity, flavor, and breadth. From homemade bread to a restaurant-style dessert selection, the tiny trailer over-delivers and surprises. For the grits, the trailer’s kitchen deseeds the peppers before dicing to keep the flavors at a moderate spice level, and uses big chunks of pepper for color and textural contrast. Drink.well. co-owner Jessica Sanders is a big fan: "Grits are an overlooked opportunity to pair with hearty meat. The Micklethwait jalapeño cheese grits are delicious and unique. You don't often see them on a BBQ menu. They are incredibly creamy, with just the right hit of jalapeño spice." 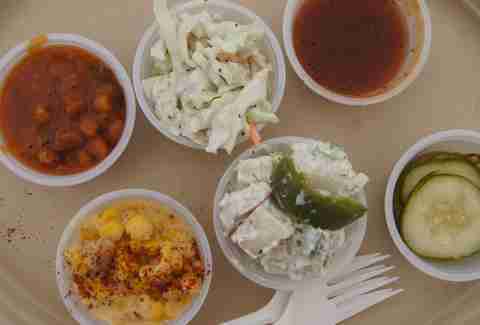 Kerlin’s sides veer toward the old school, but the unexpected star is the blue cheese slaw. The creamy, thick slaw of cabbage, carrot, and housemade blue cheese dressing has a massive richness of flavor, and doesn’t skimp on the cheese -- in fact, it seemingly attempts an equal cheese-to-veggie ratio. We like the gutsy move to actually make the slaw’s flavor more intense than Kerlin’s great 'cue -- it’s unconventional, but highly satisfying. Also getting high marks at Kerlin are the pickles. There's a surprising and lengthy spicy, peppery chile kick to the crisp, thin slices, which are seasoned with red pepper, garlic, dill, clove, and cinnamon. Owner Bill Kerlin notes that the cucumbers and dill are grown on-site whenever possible. The trailer takes an aggressive approach and succeeds. Score one for the risk-takers. Like La Barbecue itself, the sides here are a study in craftsmanship. We love the beans, which have a nice (though moderate) pepper-heat level, complemented by a very thick gravy. La Barbecue’s Ali Clem says the process is simple: "We just soak them overnight in a spice blend, then add jalapeños and cilantro." The results are some of the best beans we’ve ever tasted. The popular choice here is the Chipotle slaw, a dish solid enough to be featured as a recipe in The New York Times. While quite crunchy, the thin-but-peppery, creamy dressing brings plenty of the chile heat that Texans love. Both sides are musts during your next visit. Housed in an unassuming trailer behind Star Bar, Valentina’s has become beloved by both Downtown office workers and happy hour revelers for their elevated BBQ-Mex. Co-owner Modesty Vidal says there’s no secret to the recipes: "They’re mostly from [husband] Miguel’s mother!" For the elote-style smoked corn, Valentina's smokes full corn cobs on the pit, then cuts the kernels and seasons them with black pepper, chili powder, and salt. The finished side has crema and lime for contrast and acidity, and is rich with a smoky, spicy flavor profile. As a bonus, don’t sleep on the rice here either -- it’s done with panache, and has layered flavors of cumin, onion, tomato, and aggressive black pepper. This dish is an obvious pick -- nearly everyone in Austin has had it, whether at a picnic or a friend’s tailgate. It's more of a dessert than a side -- there’s cream cheese, whipped cream, and salted butter as glue, with a hint of salt and pepper to keep it (barely) on the savory side. Sommelier June Rodil (Jeffrey's, Josephine House) feels strongly about it: "Though they don’t make my top BBQ list, the creamed corn at Rudy's is just too good. And wrong. But, most importantly, good." Other sides also draw applause from local chefs. Olamaie chef Grae Nonas went to bat for another favorite: "I like Rudy’s Potato Salad. It is creamy and seasoned perfectly every time! It’s nothing crazy or different. But Rudy’s is underrated as a whole!" One of our favorite side-benefits to the second coming of Austin barbecue is that modern BBQ restaurants aren't afraid to tweak tradition. Perhaps the best manifestation of this is coleslaw without mayo -- sacrilege to some, perhaps, but a marked improvement on a classic side. Stiles' version throws shredded cabbage, red cabbage, and carrots together for added color and crunch, and adds lemon zest & lemon vinaigrette for a hit of both acidity and freshness. The restaurant's dressing uses lemon juice, honey, parsley, and sautéed onion oil (applied hot to wilt the cabbage) for a balance of sweet and spicy flavor.